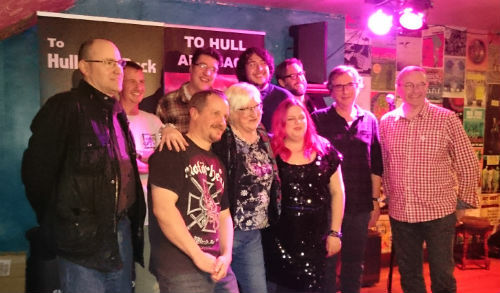 I'm proud to present The To Hull & Back humorous short story competition anthology 2016. The book was released on All Hullows' Eve (31st October 2016 (Hulloween)) and is available to buy on Amazon. 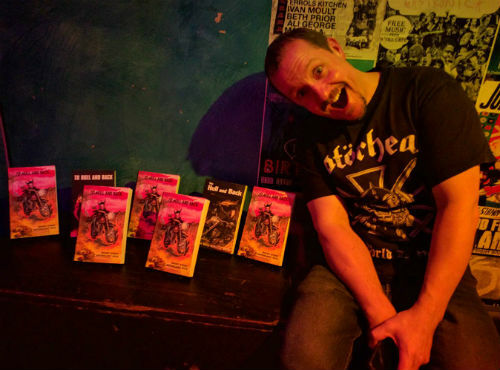 You can also buy a PDF copy of the book directly from me. You'll find full details on how to purchase the book below. 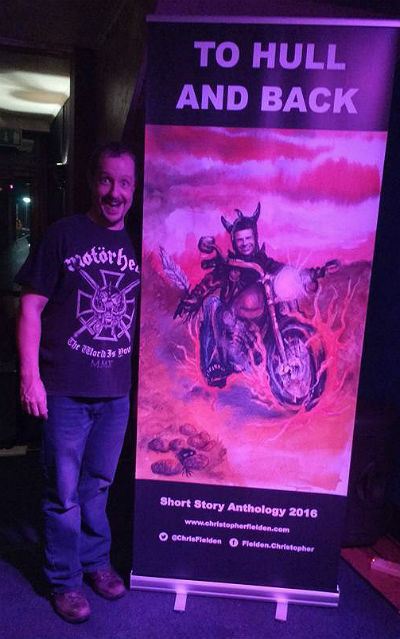 You can purchase the anthology from Amazon in print or Kindle (eBook) formats, or you can buy PDF versions of the book from me. 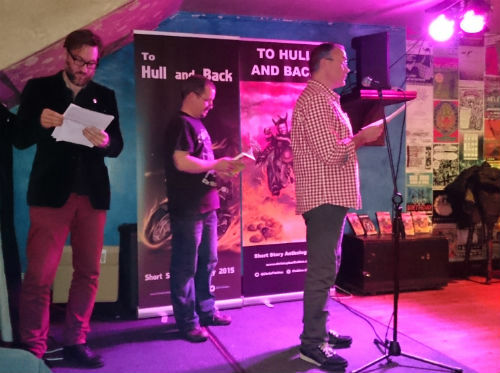 I’m proud to present the third ‘To Hull & Back’ humorous short story competition anthology. It contains a collection of 29 humorous short stories from the winning, highly commended and shortlisted entrants of the 2016 contest. The book also contains a story written by each of the judges. The stories in this book are fun and quirky, written by writers with vivid imaginations. This means all the tales are highly original and entertaining to read. I predict that each will become a fable of mirth and legend in the future. 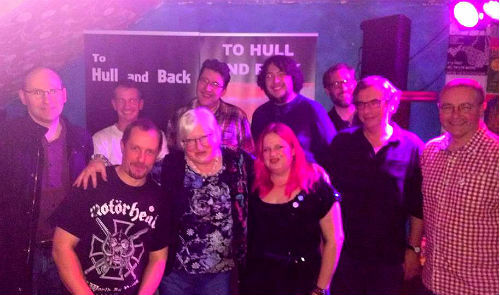 Adena Graham, AH Cassells, Anita MacCallum, Christie Cluett, Christopher Fielden, C L Raven, Dan Brotzel, Dan Purdue, Dylan Balfour, Heather Reid, Helen Combe, Ian Tucker, Jim Horlock, Joe Richardson, John Holland, Jonathan Macho, Leah Eades, Mark Rutterford, Martin Strike, Mary D'Arcy, Mel Ciavucco, Peter Ewing, Radovana Jágriková, Sarah Hitchcock, Simon James, Steph Minns, ST Ranscht, Ted Myers and Thomas David Parker. You can see all their biographies on the 2016 competition results page. 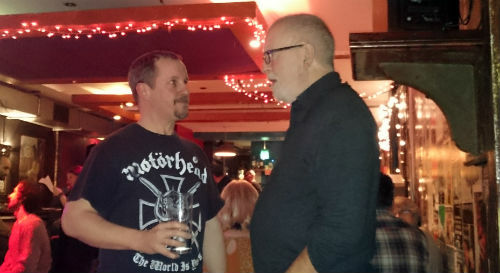 The anthology was first released on Hulloween (31st October) 2016. 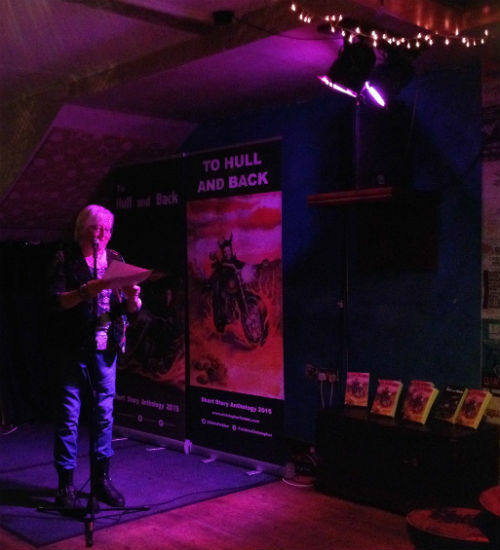 The winner’s copy of the book will make a journey on the Highway to Hull (see the video below), strapped to a two-wheeled chariot of rampant noisiness. 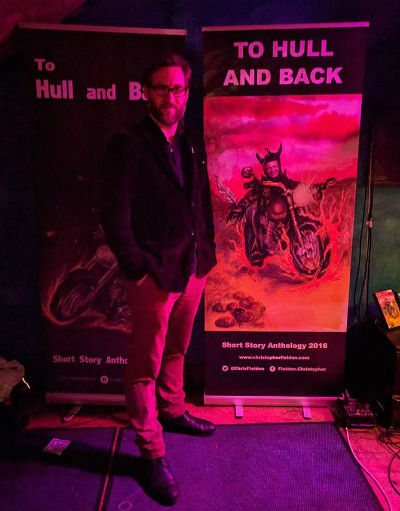 You can learn more about the meaning of the previous sentence and the ‘To Hull & Back’ competition (which currently offers the most awesome prize in the field of literature) on the To Hull & Back short story competition page. 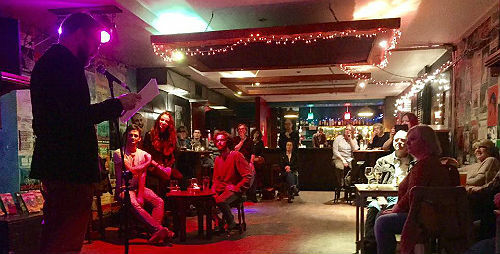 The 2016 To Hull & Back anthology launch party took place at Left Bank, 128 Cheltenham Rd, Stokes Croft, Bristol, BS6 5RW, UK, on Saturday 10th December 2016. 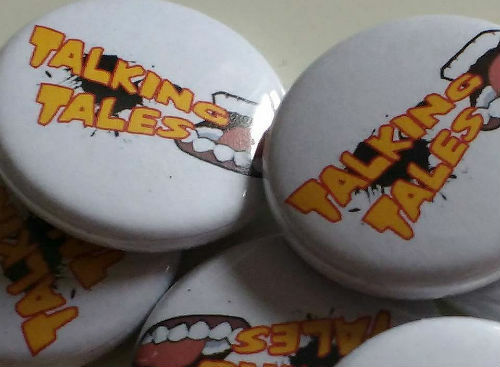 The launch was run in conjunction with Talking Tales which is one of Bristol's most popular short story telling/reading events, put on by Stokes Croft Writers. The members of SCW help me judge the competition every year. 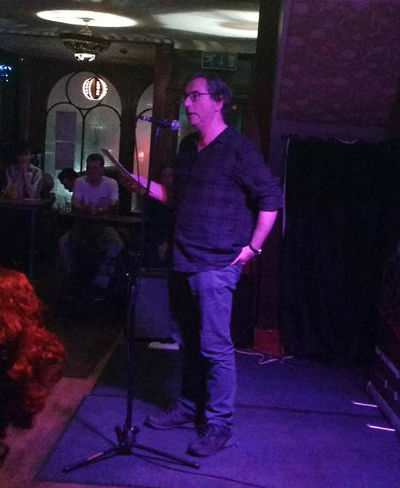 I'd like to say a big thank you to Anita MacCallum, Christie Cluett, Leah Eades, Mark Rutterford, Mel Ciavucco, Radovana Jágriková, Steph Minns and Thomas David Parker for helping me judge the competition this year. 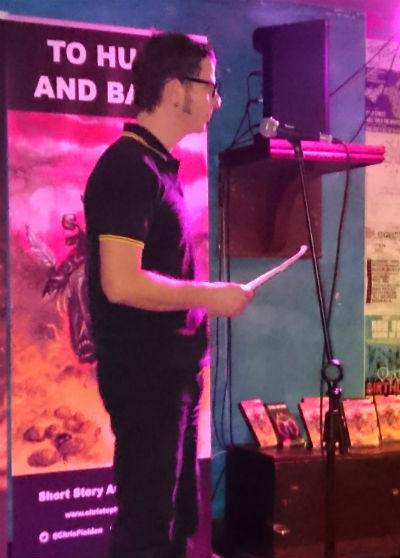 A second big thank you to Thomas David Parker for co-hosting the book launch/Talking Tales with me on the night, in a tag-team death match of literary devastation. A second big thank you to Steph Minns, for creating such a fantastic cover for the book this year. 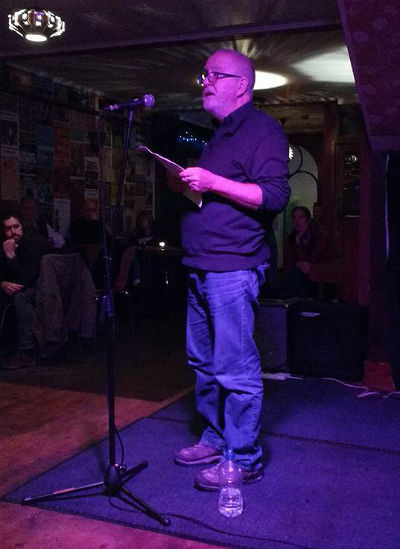 And finally, a big thank you to all the performers and authors who journeyed from all over the UK, including Bristol, Bath, Stroud, Newbury, Cardiff and Scotland to be at the event. Your support is very much appreciated. 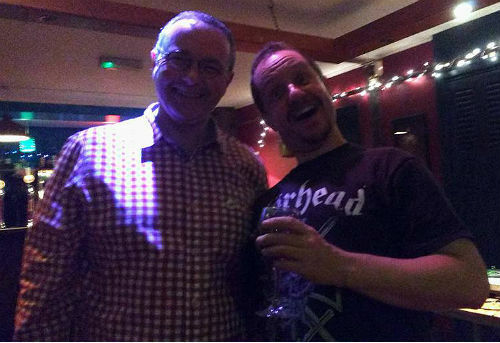 And here are some more pictures. 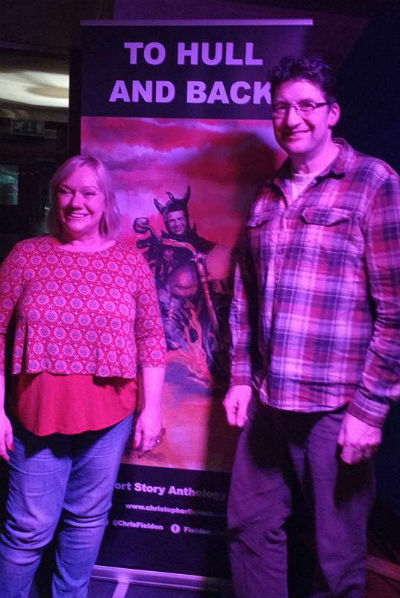 Big thanks to Kath, Mel, Mum and Tom for their fantastic photography in limited light. 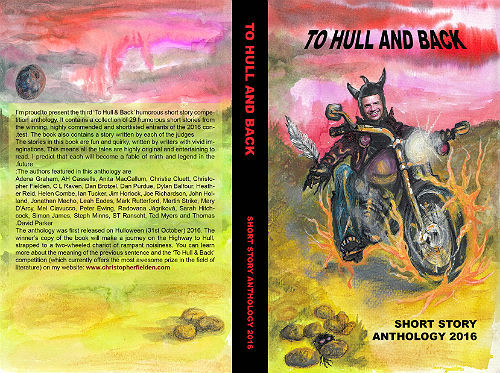 The 2016 To Hull & Back anthology cover was created by Steph Minns. 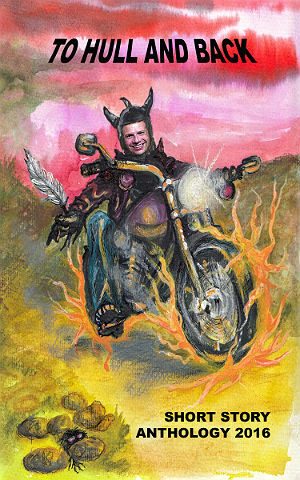 This is the first time an artist has hand painted the book cover. She's gone all Mad Max on us and it looks fabulous. Steph has been a keen painter from childhood. Her parents put up with an alien landscape she painted at age 14, complete with tree monsters, on the living room wall for years, before it was tastefully papered over. Her first custom spray paint efforts on the motorbikes of pals led to a few professional van spray paint jobs in her later teens, and a few book cover jobs too. 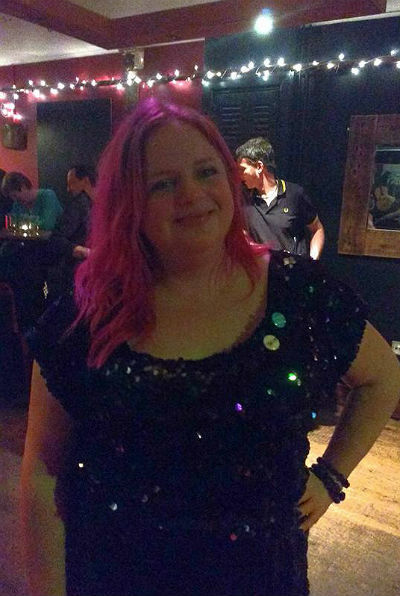 After attending the London College of Printing as a mature student, Steph worked as a print manager and designer in various public sector and charity posts, including Commissioning Editor for Assessment magazine, and Communications Officer for Stonham Housing Association and The Prostate Cancer Charity. 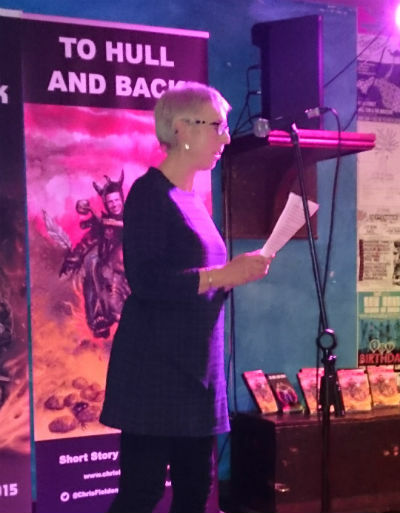 She still paints for enjoyment, while taking on the occasional book cover project, including this year's To Hull and Back, and would love to move into the book design market professionally, full-time. 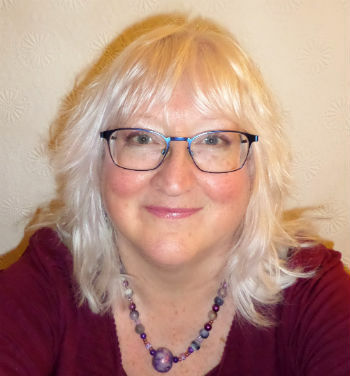 She also dabbles in several creative crafts, including fused glass and glass painting. You can learn more about Steph and her awesome artwork on her website. The website said the book will come within 48 hours and it was about 30 minutes. Excellent service. I look forward to reading it. Good luck with the sales. I hope you enjoy reading the book. Hi Chris. I have broken away from several hours deep sniffing of the glorious pages of not one but five (that's five) freshly and speedily delivered copies of the 2016 Anthology to me chosen location. I am delighted to find that my name appears on the back cover of each one (that's all five) whilst my story also takes up pages 178-185 in every one (ie 8 pages x 5 = 40. Forty). 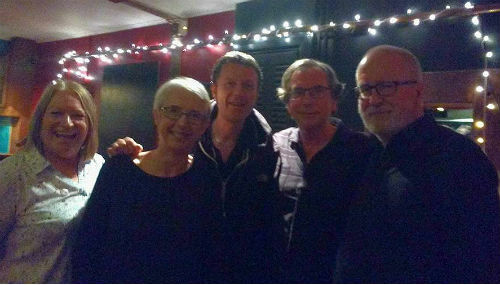 Thank you for making an old man very happy - five times in one day (five). Yours inkily. Hi Chris. Thanks very much for this, part of me now feels totally inadequate & the other part feels like coming home to a house full of like-minded friends and weirdos. I've only read the first two stories, which made me laugh out loud in places, but I am already tempted to submit something else. Can I just do it as a separate entry? Maybe use a pseudonym? I'm so glad I stumbled upon this in your list of competitions - thank you, it's bonkers in a good way. Hi Duncan. 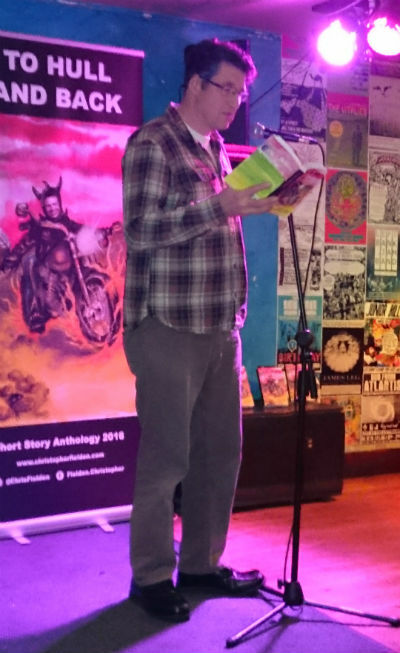 Oh good – glad you liked them :-) Humour is so subjective… it’s always nice to hear that other people enjoy the stories in the anthologies. 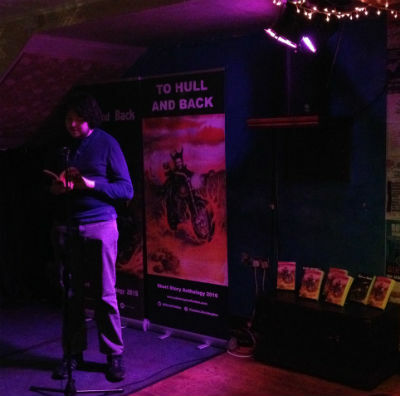 Each writer can submit up to 3 entries to each To Hull & Back competition, so feel free to send more stories. Hey, I know a young woman from Hull (no, that's not the start of a dirty limerick). 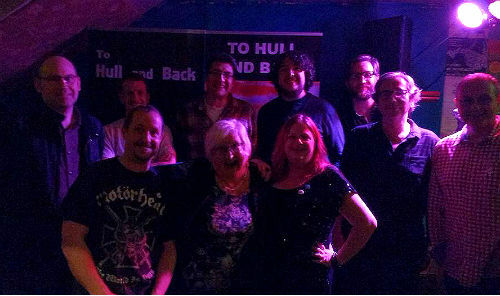 She tells me Hull is the UK City of Culture this year, and suggests you contact the organisers to see if you can get some press for the book when you arrive there. Couldn't hurt! Hi ST. No worries - I understand why you couldn't be there. The distance and cost would make it somewhat impractical...! Yes, I saw that on the TV yesterday. What great news. And what a great idea too - I'll ping them an email now.